Tell your doctor right away if any of these unlikely but serious side effects occur: chest pain, fainting, fast/pounding heartbeat, irregular heartbeat, mental/mood changes (e.g., anxiety, agitation, confusion, memory loss), muscle aches, ringing in the ears, severe headache, uncontrolled movements (tremor), unusual weight loss or gain. Tell your doctor right away if any of these rare but very serious side effects occur: muscle pain/tenderness/weakness. Get medical help right away if you have any very serious side effects, including: eye pain/swelling/redness, widened pupils, vision changes (such as seeing rainbows around lights at night). List Zyban side effects by likelihood and severity. Before using this medication, tell your doctor or pharmacist your medical history, especially of: seizures or conditions that increase your risk of seizures (including brain/head injury, brain tumors, arteriovenous malformation, eating disorders such as bulimia/anorexia nervosa), alcohol/drug dependence, diabetes, heart disease (e.g., congestive heart failure, recent heart attack), high blood pressure, kidney problems, liver problems (e.g., cirrhosis), mental/mood disorders (e.g., bipolar disorder, thoughts of suicide), personal or family history of glaucoma (angle-closure type). This drug may make you dizzy or drowsy or blur your vision. Alcohol or marijuana can make you more dizzy or drowsy. Do not drive, use machinery, or do anything that needs alertness or clear vision until you can do it safely. Avoid alcoholic beverages. Talk to your doctor if you are using marijuana. Alcohol may also increase your risk of seizures. What should I know regarding pregnancy, nursing and administering Zyban to children or the elderly? Does Zyban interact with other medications? 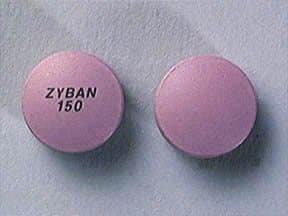 This medicine is a purple, round, film-coated, tablet imprinted with "ZYBAN 150". Are you considering switching to Zyban? How long have you been taking Zyban?